A University Police Department officer monitors the area near the GW Hospital in October 2011, responding to an armed suspect call that also brought Metro Police Department to the scene. The University’s top security official said Friday that city and campus police mishandled two reports of men with guns on campus this month. 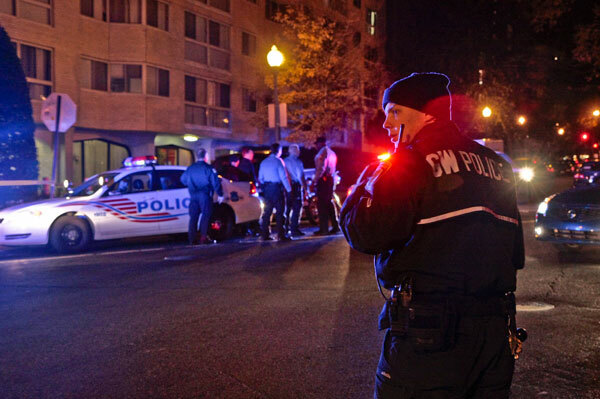 The incidents reveal what multiple University Police Department officers described as flawed communication with D.C. police – sometimes slowing down responses to even the most serious campus crime reports. But an officer who was on the scene Tuesday said his supervisors actually took three times as long to contact MPD. He said UPD received a call reporting a gunman at 5:55 p.m., but his supervisors did not contact city police until 6:42 p.m.
Before MPD arrived, the officer said UPD checked out the 10th floor for signs of trouble, even though campus police do not carry firearms. MPD was notified about the potential threat at 6:40 p.m., MPD public information officer Hugh Carew said, and more than a dozen officers arrived at South Hall in about four minutes. Carew said city police did not file a report of the incident and deferred to another agency, likely UPD. GW keeps its police records closed. One officer said his colleagues grew frustrated when they asked whether they should stop people from entering or leaving the building and their supervisors remained silent. He added that officers were still “highly upset” with the way their superiors handled the situation. A 20-year-old man, who was unaffiliated with GW, called police Nov. 12 to report that he was robbed at gunpoint at about 11:50 p.m. A Safety and Security alert, which Darnell said takes University officials a few minutes to write, hit inboxes about 4:30 a.m.
“They made a mistake. It’s just as simple as that,” Darnell said about the MPD officers who responded to the call. One officer said UPD supervisors were not aware of the robbery until an officer happened to see a post about the incident on MPD’s Twitter account. MPD Capt. Melvin Gresham said officers are supposed to inform GW’s police whenever they respond to a “major incident” on campus, including a report of an armed robbery. “I don’t have all of the particulars, but something of that magnitude, which would be a major event, there should have been more of a protocol enforced. So the MPD officers should have made sure that the senior GW staff were aware,” Gresham said about the Nov. 12 incident. “[Campus police agencies] can build relationships and make requests for information from their local law enforcement partners, but they can’t force them to communicate in a timely manner. Sometimes they get busy or forget to communicate in a timely manner,” said Stafford, who now works as a consultant for universities in their efforts to comply with federal campus safety guidelines. UPD’s failed communication at South Hall was not the first time the department slipped up when it received a report of a gunman on campus. In September 2011, administrators learned that a man had threatened to shoot doctors and patients with an AK-47 at the Medical Faculty Associates building. UPD did not alert city police for two hours, according to police documents and statements from an MPD officer, though Darnell said then that the University called MPD immediately. Months later, UPD sent its officers to search for a possible gunman in Gelman Library instead of notifying the Secret Service or MPD, which were both already on campus, said a UPD officer who spoke on the condition of anonymity. The Secret Service had earlier reported that a man with a handgun had run away from the White House and potentially toward campus. Darnell said GW has “a process in place where [MPD is] supposed to notify us” – either by flagging down a campus police officer on the street or making a call straight to the chief. But city officers are not required to contact UPD when they respond to a crime on campus, leaving no way to fully gauge the scope of GW’s campus crime. He added that his office tries to “make sure that we’re on top of all cases that involve students,” but some crimes might slip through the cracks. “No system is perfect so I can’t sit here and say that that’s never happened. I’m sure it’s happened,” Darnell said. Darnell said the University does allow some leeway for MPD, which deals with security operations for demonstrations and visits from high-ranking government officials every day, in addition to crime. One UPD officer said patrols have frequently stumbled upon MPD responding to crimes on campus. He said there have been instances when city police did not tell the University that they were on GW property, until UPD officers ran into them. “They definitely did not let us know until we basically asked them,” the officer said. He said part of the reason could be that UPD dispatchers are stretched too thin. Dispatchers must listen to a police scanner, answer calls and watch feeds of cameras across campus all at the same time. Another officer agreed, saying a shift in the dispatch booth “can be a little overwhelming” and “kind of hectic.” He said the department is looking to hire a second full-time employee to help take calls around the clock. This article appeared in the November 25, 2013 issue of the Hatchet.